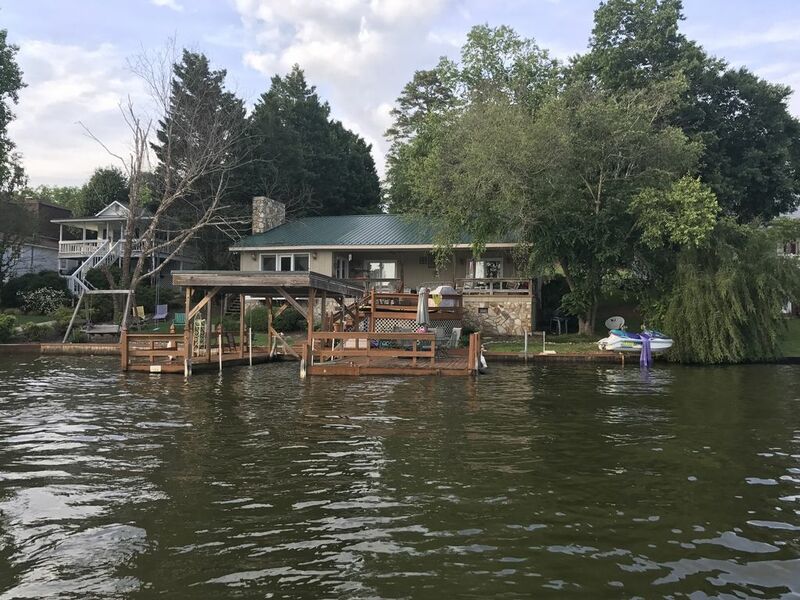 This cozy lake retreat 4BD 2BA lakefront home has awesome views of the lake! With the Uwharrie National Forest right around the cove. Located approximately 1 hour from Charlotte, Greensboro, Winston Salem and High Point. This slice of heaven is just perfect for a family vacation, anniversary, friends' getaway or fishing retreat. You name if and you will enjoy your time here. Master with a King bed, 2nd bedroom with a queen bed, 3rd bedroom with two twin beds and an upstairs loft/play area with an additional two twin beds. A large lake view front porch with ceiling fans, rocking chairs and a swing. We love our animals too but have a NO PETS policy. The lake is just steps away from the front porch. A dock and steps leading into the water are convenient for taking a cool dip. Bring your boat or jet ski and enjoy fishing and the serenity of the lake's 115 miles of shoreline. The dock has room for a boat or jet ski to tie up and access to deep water. Amenities include a fully equipped kitchen, washer/dryer, utilities, gas grill for outdoor cooking, outdoor tables and chairs, satelite Dish televisions, dvds, books and games. Three kayaks and one paddle board are available (with life jackets) to enjoy exploring the lake or fishing for dinner. Park you automobile in our covered carport area with room for more parking on our paved cement driveway. For those seeking more adventure... hike or bike the Uwharrie National Forest across the lake (accessed a few miles away by car). Pontoon boat rentals may be available from FishTales Marina or Ole North State Marina. This is a very nice home to stay in while you enjoy Badin Lake. We brought our boat and caught numerous fish out of the lake during our few days there. The driveway has enough room for a 20ft boat trailer and truck, we were unable to get another truck into the driveway without blocking a portion of the road. The only reason I say this is so that you can plan accordingly if you are bringing your boat to this house. Tammy was excellent with communications in the days leading up to our trip. I am sure she would have been very helpful while we were there but we did not need anything during our stay. I would recommend this place to a friend and will likely book again if we want to fish Badin in the future. We really enjoyed the outdoor space and the fishing on Baden Lake. The home had everything we needed and was well taken care of and the owners were very hospitable and helpful. We'd definitely go again! Wonderful, long weekend at the lake! We had such a wonderful time at Tammy's house! The location on the lake is perfect and the dock is an added bonus! Our kids enjoyed swimming off of the dock as well as the paddle board. The house was perfect for our family. We had 4 adults and 4 children and the setup worked well for us! The kitchen is stocked well with everything you need to prepare meals. We didn't leave the house one time while we were there for 5 days. We will definitely rent from Tammy again! We absolutely loved our stay here at the lake. The home was well equipped with everything needed and spacious enough for family to come and go, the dock area was great we were able to keep our boat in the water during the entire week. Very relaxing enjoyable vacation! Very nice house Owner kept in touch via emails to give directions and answer questions quickly Would love to return.